Partnering with Yahoo on branded bracket games around two major sports events this year paid off in millions of online orders for Pizza Hut, the fast-food brand reports. In fact, the games, combined with Yahoo marketing campaigns, resulted in Pizza Hut’s three biggest-ever digital transaction days. Pizza Hut had set a record for online orders during 2016’s Super Bowl, and the brand wanted to build on that in 2017. 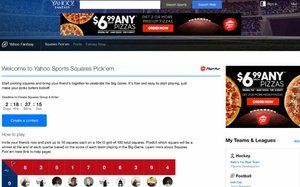 Yahoo and Pizza Hut collaborated to launch Squares Pick’em, the first digital game of its kind on Yahoo Sports, to engage fans before and during the 2017 Super Bowl. After signing up, users invited friends to pick Pizza Hut-themed boxes on a 10 x 10 grid. Each square represented a possible score at the end of every quarter of the game. The winners weren’t offered any big prizes; they were motivated simply by the chance to be able to brag about their picks. Pizza Hut continuously engaged fans, offering promotions for online orders using advertising on the Yahoo homepage and Yahoo Sports, as well as extensive native, display, search and email advertising. Fans spent more than 9 million minutes playing Yahoo’s Squares Pick'em around the Big Game, and 70% of consumers accessed the game on their mobile devices or tablets. Based on the success in converting that Super Bowl bracket-game engagement to orders on PizzaHut.com (Pizza Hut isn’t revealing the exact numbers of transactions), the brand went on to sponsor Yahoo Sports’ Tourney Pick'em — a bracket challenge on the Yahoo Fantasy app and desktop experience timed for the Men’s NCAA Tournament.